Today I created a revamped the profile script for administrating a SDL Web 8 Content Management Server. (SDL Web 8 is formally known as the SDL Tridion product). The script already existed for Tridion 2011/2013. Only with renaming the product to SDL Web 8, also the services were changed. 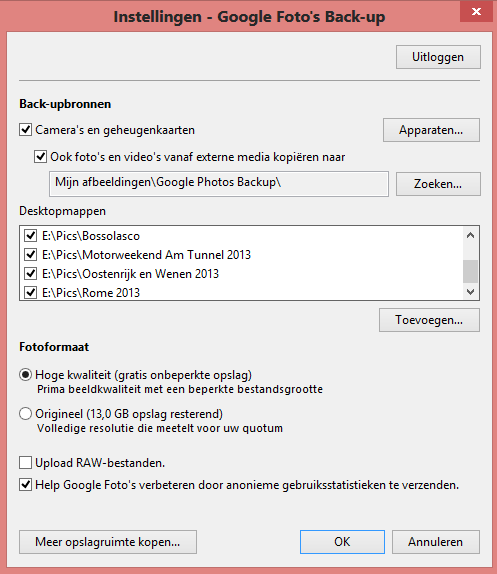 If you care about your holiday pictures and other nice memories, you need to backup them for in case your harddisk fails on you. Some people use DVDs, NAS or other devices, but the cloud is becoming a more and more popular solution. A few weeks ago Google announced the new plans around Google Photos. Google Photo gives you unlimited storage space if you are willing to limit photo resolution to 16 megapixels and video resolution to 1080p. You do have the option to store at higher resolutions, but the storage counts against your Google Drive quota. For a more in depth-review, see this excellent post of ExtremeTech. The nicest thing is that Google has developed a system tray application for Windows to auto-synch certain local folders. Login at https://photos.google.com/ with your Google account. Go to the apps area and download the Desktop Uploader. 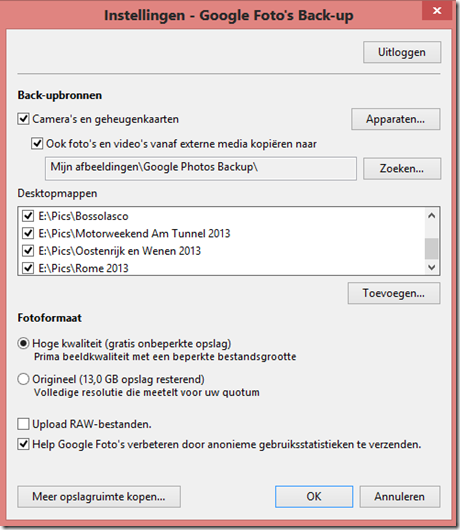 BTW 1: If you already have Google Picasa you can upload albums also from there. BTW 2: In the apps area you saw that there are also Android and iOS apps available for mobile devices.